Apple cinnamon bliss balls are my new favourite flavour of bliss balls. After making the same standard almond and cacao flavour bliss ball for quite a while now, I was on the hunt for something new. I was also hunting for a nut free bliss ball that the kids can take to school. The apple cinnamon bliss balls taste like a delicious apple pie with a drizzle of caramel on it. I came across a few varieties of the apple cinnamon bliss ball, but many called for fruit juice to be added to the mixture. The addition of fruit juice to the apple cinnamon bliss ball was not really needed, plus to pushed the sugar content up far to high. Remember, as great as bliss balls can be, they do use medjool dates that are naturally high in sugar. The medjool dates are also rich in nutrients, but you don’t want to be adding extra sugar in the way of juice to the mixture. 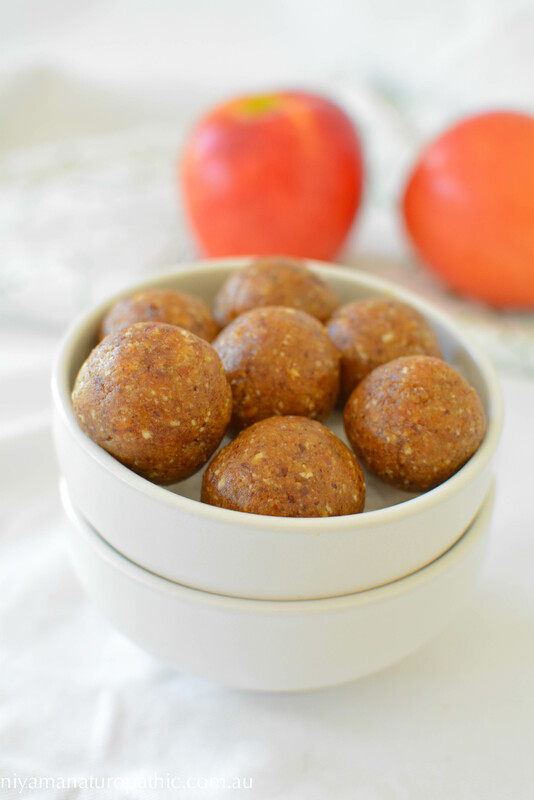 Instead of the juice, I used coconut oil in this apple bliss ball recipe. I was also wanting a nut free bliss ball that would be school lunch box friendly. I normally always add nuts to bliss balls as this increases the protein content. If you did not need this recipe to be nut free, then I would suggest to add some nuts to boost the protein content of these balls. Cashews would blend really nicely into this mixture. You could add 1/4 cup and maybe another teaspoon of coconut oil so that it is not too dry. By including protein into your bliss balls, you help to balance out the nutrient profile so that it is not mainly sugar from the dried fruit. The addition of the coconut oil does the same balancing act by adding in some healthy fats. Remember, when we team our carbohydrates (sugars) with protein and fat, we don’t get that sharp rise in blood sugar and in turn you don’t get such a dramatic insulin response. These are quite a firm and chewy bliss ball compared to my usual ones. However, I find this is ideal if you want them to maintain their shape and texture whilst sitting in a warm lunch box all day. If you prefer a more gooey bliss ball, then just increase the coconut oil content. Well, I hope you enjoy these Apple Cinnamon Bliss Balls as much as we do. Place all the ingredients into a food processor. Blend until the ingredients are mixed into a smooth texture. Roll the mixture into small bites sized balls.